I mentioned Imaro in the comments of the Diversity in SF Fiction post, but it deserves more highlighting. Last year, the Carl Brandon Society blog announced that Night Shade Books was reissuing the book. When I next saw the proprietor of Night Shade (that would be the fabulous Jeremy Lassen) I pointed and squeed at the book, saying I’d always heard about it but never saw (the first edition) in stores. Being the awesome guy that he is, he gave me a free copy of the book and told me to evangelize to the masses. I’ve been doing that ever since and will continue to do so. 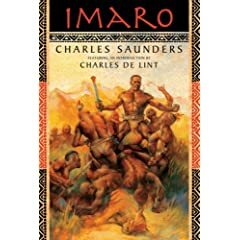 Imaro is a rare gem of fantasy literature — a book about black people in Africa by a black man that doesn’t portray black people or Africa in clichéd, racist ways. The world of Africa in Imaro is diverse (from its people to its geography) and beautiful and brutal and complex. Just like the main character himself. The novel encompasses several stories that all fold into the larger narrative where Imaro gets to the truth of who he is and how he fits in the world. Ever since I reached the cliffhanger ending, I’ve been telling everyone I know to keep buying the book and prove audience interest. Must have worked, because now Imaro 2: The Quest for Cush is on the stands. I always say to people that they shouldn’t buy Imaro just because it’s by a black person about black people but because it is just a really fabulous fantasy story – hell, it’s fabulous fiction, period. But supporting a black man writing about black people will encourage more SF/F publishers to take a chance on black authors writing black people. And that can only make the world a better place. I’ve not heard of this book. I’ll definitely try to get hold of a copy. Looks interesting. I always liked sword and sorcery books.